There is a certain truth to the phrase: "every man's trash is another man's treasure." I do believed I learned this truth today. After a dreary, rainy day in Pennsylvania (which are common, but still depressing), I discovered a painting that had been laid up against my apartment complex's dumpster as I threw away some of my own trash. At first, I paid it no attention as I am not in the habit of recovering other peoples' disposed of items. But upon further investigation, I changed my mind. 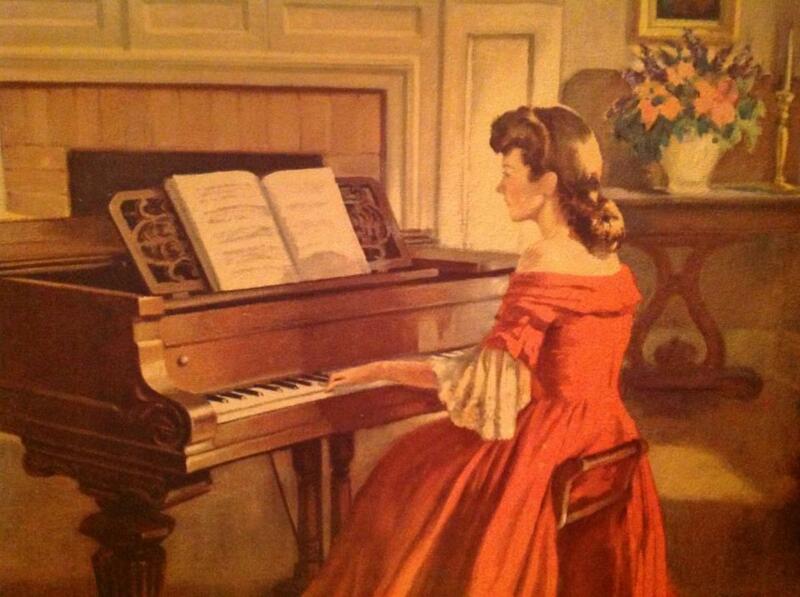 As is visible in the picture, the painting is of a young girl in a red dress playing the piano. She appears lost in the creation of her music and appears to be without thought as she sits at her piano, and her beautiful and vibrant solitude inspired me. Mainly, it was the style of the print that fascinated me, for I am not accustomed to works of art that seem to incorporate themes of both light and dark as well as a single, solitary focus. Perhaps what drew me the most was the fact that this young pianist appears to be playing alone and in a large room, all the while wearing a magnificent dress. Needless to say, I took this painting from the dumpster and ran back to my apartment so that my neighbors wouldn't see me carrying someone else's trash. Once inside and out of the rain, I proceeded to research the painting's origins in hopes that I would learn more about its subject. I was surprised to discover that not much is known about this painting, nor its painter. Several sites featured people who had either stumbled upon the work in a consignment shop or had inherited it after the death of a relative. In addition, there were scores of people who were desperately searching for this painting due to its sentimental value. The painting I have recovered from its intended final resting place is in fact quite old, and unfortunately in very poor condition. I believe that the painting had been hiding in one of my neighbor's apartments and was discarded with the remainder of the spring cleaning trash. The frame is not in decent shape, and parts of it actually crumbled to the touch. But the print itself seemed relatively well preserved with the exception of some newly-sustained water damage due to the rainy weather of that afternoon. Which brings me to my next point- how could someone just toss a beautiful work of art such as this? As I said before, the painting itself is in less than ideal condition, however I can only imagine that the beauty of its elements remain the same as they were when they were first committed to canvas. Such a travesty! For those art fanatics out there, or for anyone is simply more intelligent than I in the manner of artwork, the artist's name is signed at the bottom, a "M. Ditlef". The painting itself is titled "Sonata" and is the sister of several other works illustrated in the same Victorian style. And because I was unable to discover any information whatsoever about its origins, I have ceased investigating this painting for now. .....what I DID discover, however, is that the picture is worth over $300.00, even in very poor shape. Needless to say, my find brightened my day and I do intend on keeping the painting; I quite admire the young lady that it features. My question is who the subjects of these exquisite works actually are; I don't doubt in the least that they were real people. But who were they, and what was it about them that inspired this mysterious artist to feature them front and center? Judging from their clothing, I can only assume that these ladies were royalty of some sort, but from which lineage, I am unsure. All of these works appear to be done in the style of Victorian art, which typically features bright- and often garish- colors. According to the very minimum amount of information available about this painting, the artist was responsible for creating similar, Victorian-style works of art involving other striking young women playing various musical instruments. The quality of these pieces is high, and the originals as well as preserved prints of those originals are highly sought after. Perhaps even more interesting is that in the video below, this print is referred to as "Allegro" instead of "Sonata". The one featured in this video is in fair greater condition than mine is; however, this is the exact same print and even the frame appears to be the same! But according to the consensus in the comment section, one thing is for sure: this is the "Sonata". Have you ever found a treasure in someone else's trash? Very little is known about the artist who created the painting from which this print- and many others- originated. According to the link below, only two of his works have ever been recovered. It is uncertain who exactly this individual was, if he used a pseudonym for any of his works, or if the reason for the lack of information was an untimely end to the artist's life. One possible theory includes that "M. Ditlef" is actually the same person as Antoni Ditlef, who signed his works as "Allegro, M. Ditlef". There is a strong possibility that he changed his signature, or that over the course of time damage to the original paintings caused his signings to appear as though his name was "M. Ditlef". However- according to the image at right- they are, in fact, two different people. Overall, there is a noticeable lack of solid information on either of these two people, the paintings that were signed with their common last name, or the subjects that inspired these creations. What a mystery to ponder on a lonely, rainy day! Since I originally published this article, I've stumbled across some additional sites that feature both information and the works of Antoni Ditlef. Certainly, one can see the similarities between this gentlemen and his elusive counterpart, M. Ditlef. He now has his own Pinterest page and his prints of her original works are now advertised on many sites, but he still remains mysterious in the sense that I have yet to find any biographical information about him at all. Unfortunately, it appears that this happens frequently to the less-renown artists of old whose works fail to impress the mainstream. If nothing else, I owe the negligent person who discarded this magnificent print a "thank you" for the mystery their former possession has brought into my life, and I anticipate discovering more information about the artist and his life. From what little I have already unearthed, this Ditlef sounds like a curious yet cryptic figure who created beautiful pictures despite a lack of renown and fame. Quite the true artist, if you ask me! What an intriguing find. I hope you find the answers to the mystery. These are all Turner brand prints. The Turner company operated into the 1980s and owned the original and all reproduction rights to the 'Sonata' painting. Turner made decorative wall pieces including mirrors to be mass marketed for everyday purposes. The only value of these pieces is as décor and sentimental. As an art historian I can tell you that the painting is meant to evoke the pre-civil war era. 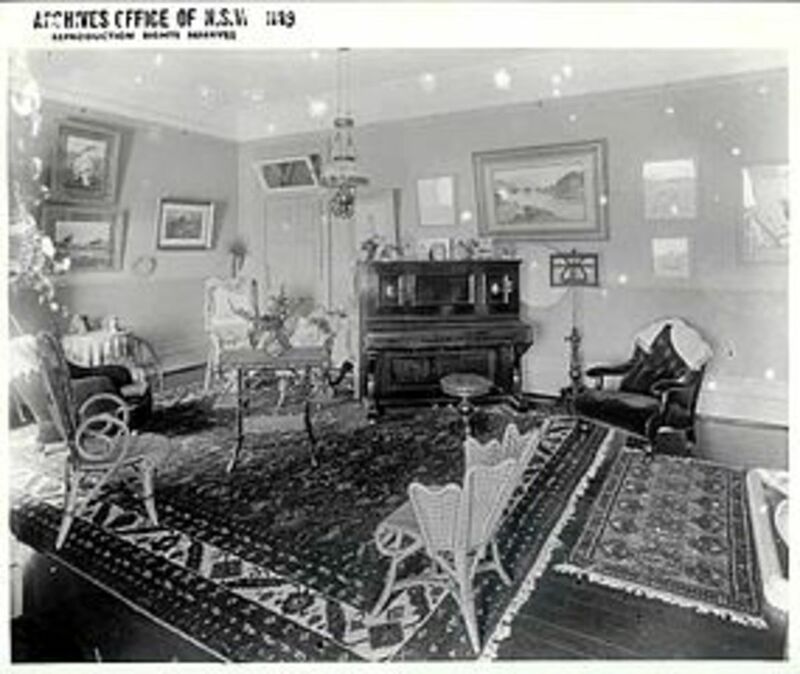 The furnishings are American Empire style. The entire composition is very, very close in sentiment to the movie "Gone With the Wind" which is a 1930s look at the 1860s. While the furniture is reasonably well done please notice that the mantelpiece and window do not look like those in real Victorian interiors - but more like the stage sets from the 1930s in the movie. In fact the painter is either painting very ungainly architectural details or is simply not proficient in this area of painting. Note too that the woman's hair and face conform to a softer 20th Century standards of fashion and beauty rather than looking something like a stiff portrait of Queen Victoria - which would have been the norm for a real 1860s painting. This is an evocative piece but is most likely from the 1930s or so. 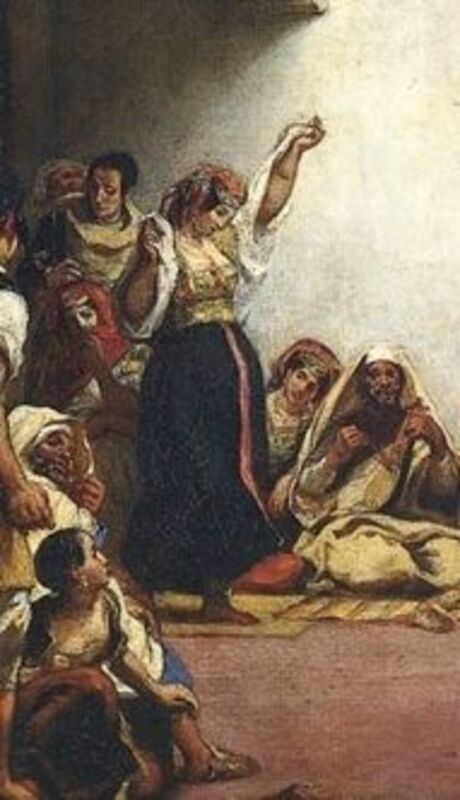 According to the Turner family the original is owned by the family yet and if that is true you find a bonafid painting rather than the print of this it is a copy. Thank you, Misti, for stopping by! This seems to be a fairly popular picture and one that has brought joy to many people. Dolores, you might want to take your painting to an appraiser. They should be able to determine if it's genuine and how much it might be worth. Please keep us updated! Thank you for all of your research as I have always wondered who painted it but never really thought to research. I have the song of love painted by M. Ditlef, I got it at a yard sale for $8. Its a flawless print in a beautiful frame, its from the 1930s and worth as of 2 years ago over $300. There is only 3 paintings that have been found of Ditlef's, if you have an oil painting of this particular print its worth around $1,500 or more..........depending upon the condition of it. 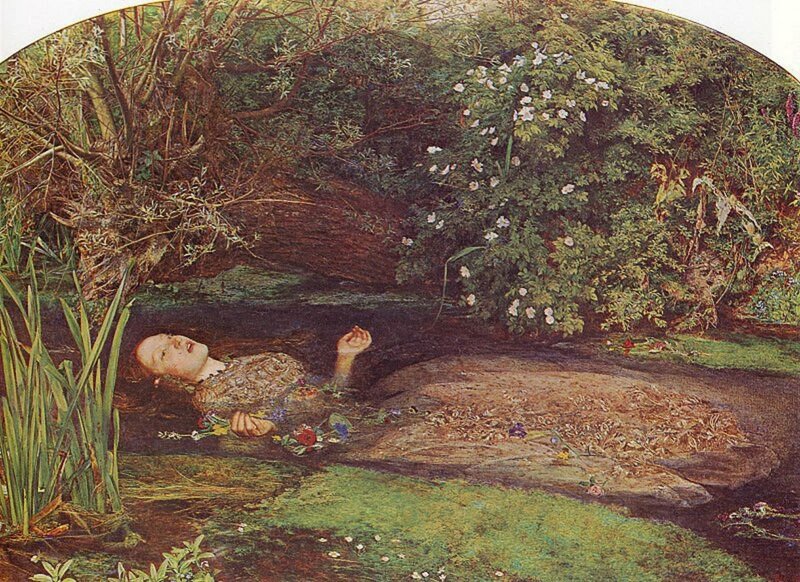 This painting originated in the late 1800s......I absolutely love it, its going on my bedroom wall where it will stay. I have the picture of the girl in red that my father bought back in the early 60's and it hung in my patents' home until my mother left it to me 6 years ago. I love the peace it gives to me. I do wish to clean it but have no desire to ruin it. Does anyone know the correct way to clean? I have a lithograph of "enchantment" by Antoni Ditlef, I'm trying to find out something about the artist. If anyone knows anything please message me. Thank you. I have this M. Ditlef painting, it was my Grandmothers. However I need to sell it. In what littlebit that I came up was that M Ditlef is a mystery and 3 paintings can be found, our 2 and a duet all depicting women on the piano.It is very strange and intriguing :) if I come up with anything else I will share :) I'm so glad you found yours and are able to enjoy it! You're very welcome! It's interesting because I've seen your painting during my research online, and the two artists share the same last name but they're supposedly not related? Something very strange is going on here. Let me know if you find anything else out! Oh my gosh, I'm so glad I came across your story, I just bought a painting similar but my gal is in a blue dress and I've been trying to figure out the artist, I didn't want to take it out of its frame or further damage the painting but I knew it ended with a ilef, at first I thought it was nilet or something . Like yours there is some damage but it is beautiful and in what appears to be the original frame. :) Now I have a place to start! Thank you!!! I will most definitely keep you posted. I sent pictures to a sight that likes to buy work. I'm waiting to hear what they say. I don't like taking it out of the frame, but had to do it to photograph it. I think it may be Maude Eggemeyer's early work. I'm always finding pictures with a chance of them being a treasure just from look and feel. Talk to you soon. Hi Deborah! I'm not too much of an art expert, but it seems like if the color is coming off of the painting you have then it might be authentic. The print that I have was made on a cardboard-type medium and the colors certainly do not bleed. You might have something of value there! If you decide to get it assessed, please update us! I also have this painting hanging on the wall in my guest bedroom. I was so hoping it was an original, because you can see and feel the brush strokes. However, I wasn't too sad that it wasn't. It's still very beautiful and appreciated. I believe I've found an original Maude Eggemeyer watercolor. I don't think it's a print because after running a small cloth over some of the red in it, the red came off on the cloth. But who knows, maybe that happens with prints too. It is a beautiful painting, albeit a tad on the dark side, almost somber. Thanks for all your comments! I've had this painting for years now. Found it at a yard sale. My daughter fell in love with it. Bought it for $3.00. It is in great shape. I have this painting in the original frame in pretty good condition i like it i just have know were to put it up so it has been stored for awhile. I bought a very very old print of this painting in it's origonal wood frame at an estate sale $5. The colors are so faded you can barely tell the dress is red but the beauty of the painting is still there. I just love it. Is this a painting or a print? 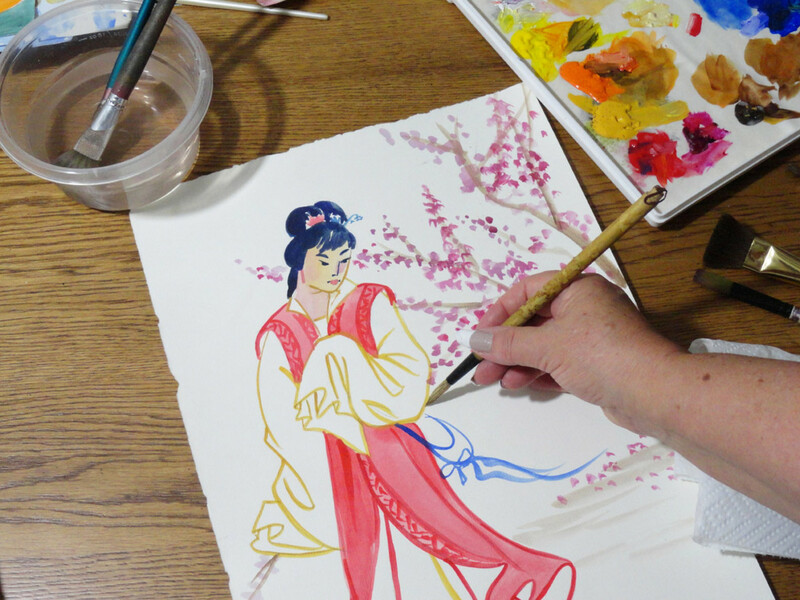 The prints seem to be common, but if yours is a painting, then it is likely to be one of a kind. Ditlef did Victorian musical artwork and seemed to have a penchant for young women at pianos. does anyone have a date for the original prints? Wow....$50,000? No way! I don't think mine is in the original frame, and it's only a print, but it's still quite a catch! Natalie, I haven't been able to find any information about how much a print is worth exactly, but feel free to update me if you stumble across something! you are not going to beliecve this, but I found the same exact painting in a Chicago alley, leaning next to a dumpster, rescued it, and its been hanging in my home for five years. Mine is in good condition, where did you find how much it is worth? Hi.I stumbled upon this site and am so happy I did. I can't stop reading, etc. Anyway I got here searching myself for imformation about a framed print my grandmother left, me also called SONATA, but the artist is Jane Freeman.It also has a girl playing piano in blue dress. I wonder if anyone here could tell me anything. Artist-for-Hire. If the bond between the painting and the artist is that strong, it should never leave the artist's home. Look at the pleasure this find is bringing. Is it better to have our work gathering dust, or enjoyed. I say, the latter, and I plan on putting work out by a dumpster. I have the painting as well I found it at a flea market and I have had it for 3 years I am finally going to hang it in my apt. It is so soothing to the site. LOVE IT. I also love this painting. It hung over my grandmother's piano in her house. I have no idea where it ended up, but I always loved it as a child. I bought a piano a few years ago and have wanted to find that painting to hang over it. My sister just found it for $25 at a second-hand store! I'm so thrilled! Very interesting story! Thanks for sharing :) Hope you were able to find more info on the artist! 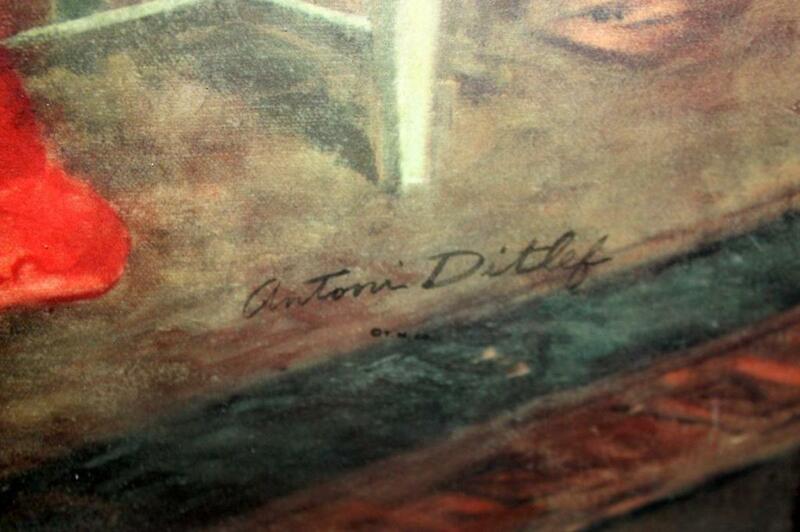 My sister just picked up a copy of "Sonata" by Antoni Ditlef for $25 from a resale shop. The reason she bought it is because her and I grew up with this picture hanging on our livingroom wall. Sadly, our mother passed away when I was 10 and she was 6 so this painting has sentimental and nostalgic value to us. So I looked into the whole thing and well...you can look it up yourself. Go to WWW.Ditlef.com to see all the "Victorian Musicals" paintings and to see their reproductive values. I am still looking for information on the original and if it is still available. I love your article by the way and posted it on Facebook. Thank you for sharing. Hope my reply was helpful. God bless you! I happen to have the exact same painting. Mine happed to have been my Grand parents and it hung in their parlor from the time I was born. I am now 50YO and have the painting in my didning room now and LOVE it. I just wish I know more about the artist and value. To me priceless. I have a print of M. Ditlef that is Song of Love that is in the same frame as your photo. It hung for I don't know how many years in a log cabin up in Dutch Flat. The cabin was built by my friends grandparents well over 50 years ago. Not sure how long it hung there but in excellent condition. I didn't find anything for a long time on it. It is more on loan to me as it still belongs to my girlfriend. I do however enjoy looking at it every day. Remember just because it is a treasure to one person another may not even see the beauty. thanks! 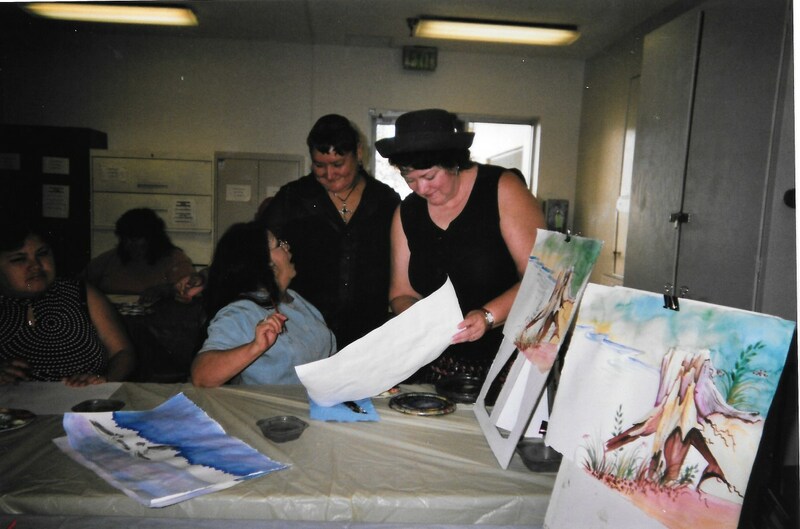 Arts are my favorite endeavor! Hello. 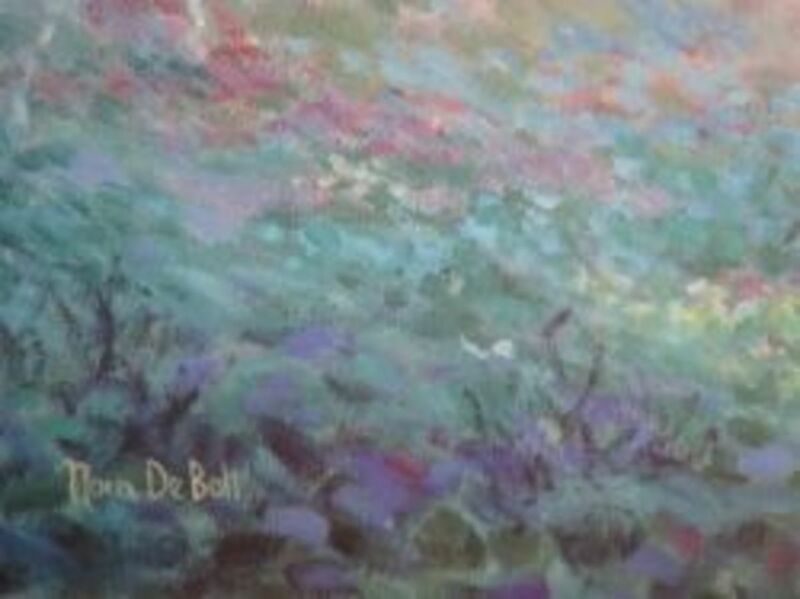 I have a beautifully framed painting of "Sonata" by M Ditlef in flawless condition. I would entertain any offers to sell it. Sorry for the late response, Phillygirl, but thanks for the memory! My "Sonata" has since been reframed and displayed in my hallway. It is still wonderful to look at, even after all of those days hanging out by the dumpster! My Grandparents had this hanging in their living room until they both passed away. My aunt bought the house and I don't know what happened to the painting ( family fueds, won't talk to us, sad)I loved this painting as a child and have been looking everywhere for it!! So excited to finally see it, have been searching for months on web! I agree it is a beautiful painting, wish I had my grandparents! No clue. Thank goodness that I have no issues with dumpster-diving or that thing (which is now hanging in my living room) would have been long gone! Who would ever toss a painting in the trash? What a #$&%. Nice find and great Hub. Nice to see you again, Artist! It is a very lovely print despite its age. It most needs some touching-up and restoration. You're correct about the two names; at first, I believed them to be siblings, but their works are too extremely similar. Others have suggested that M. Ditlef is actually a woman who changed her name for some reason on another, perhaps marriage. It is all very interesting...and mildly frustrating! Don't these people know how much time and effort we invest in our work? Grr, it's SO frustrating. Work like that takes weeks if not months to paint...don't they realise the bond we form with our work after that length of time is comparable to the bond we have with our children? You got me...I'm very curious now. These old paintings can be difficult to find. You can try askart.com - you can search artists alphabetically. To complicate matters there was an A.Ditlef as well as M.Ditlef = there is a thought that they may be one & the same. 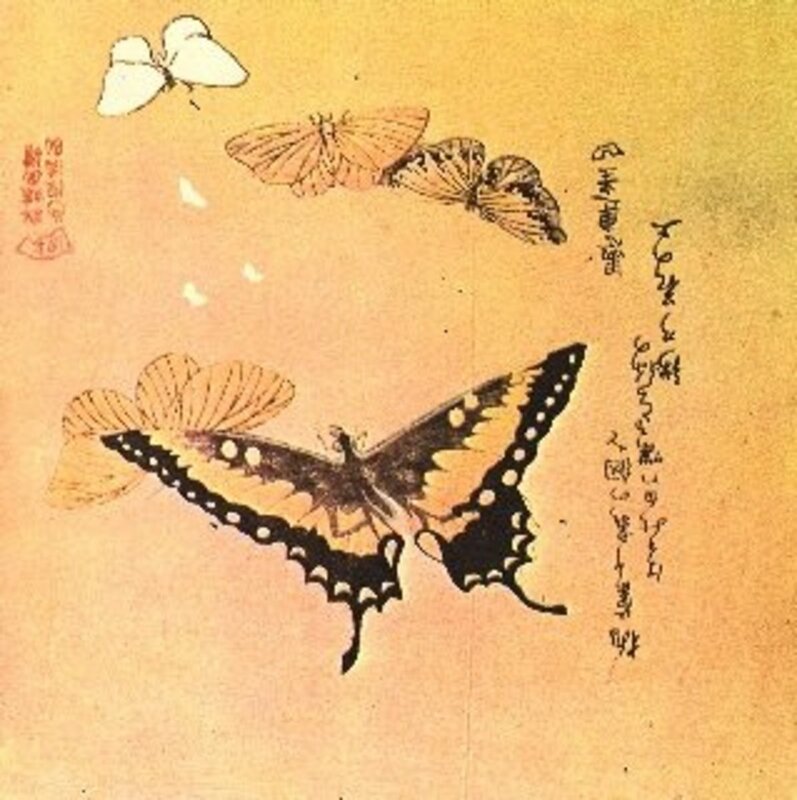 Reproductions prints of this ilk flourished early last century as the tech took off. Sadly, this was pre-internet so unless the artist was a "somebody"...the knowledge will have been lost.